MAAX SUBMITTAL SPECIFICATIONS KDS 3448 (New 4-P Unit) MODEL NUMBER 145030 TECHNICAL DRAWINGS REINFORCEMENT BACKING RIGHT SEAT SHOWN LEFT SEAT SYMMETRICAL DOOR OPENING OPTION 20198 SHOWN OPTION 20197 SYMMETRICAL GRAB BARS All dimensions are approximate. Structure measurements must be verified against the unit to ensure proper fit. 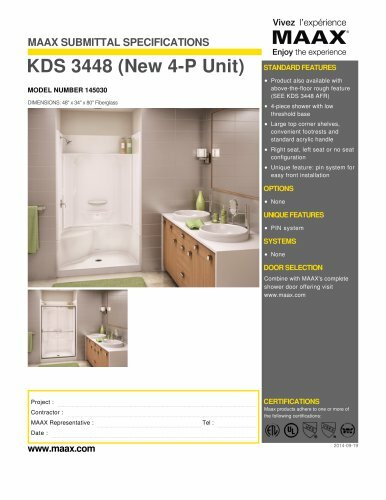 *Dimensions indicated on product pages exclude tiling flanges.